From Emmaus we return to nearby Bethlehem where we “break bread” at Manger Square. A typical lunch is falafels. Instead of sandwich bread they use pita bread and stuff it with food. Falafels are filled with vegetables (don’t ask me to name them! ), fried humus (don’t ask me to explain what that is!) and covered in a yummy sauce that often oozed out onto our laps (don’t ask me to tell you how many napkins I needed!). Orange juice is served everywhere, and it is so fresh that often we actually watch the vendor squeeze the juice directly into our cups. 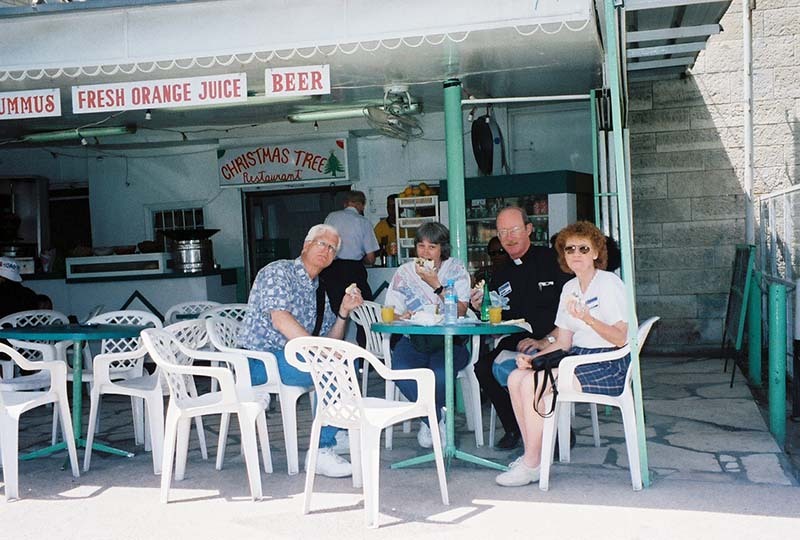 (Below) Father Ed and I eat at Bethlehem’s “Christmas Tree Restaurant” (an outdoor cafe) with two of his parishioners, George and Mary.